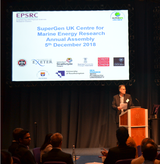 The SuperGen UKCMER Annual Assembly was held on the 5th of December in Edinburgh. At this event, the projects that have received funding presented their work that is accelerating the deployment of marine renewable energy. ​The Policy and Innovation Group has developed educational materials as part of ETIP Ocean. With these materials you can learn about the key benefits and challenges associated with ocean energy. You can find the materials on the ETIP Ocean website. 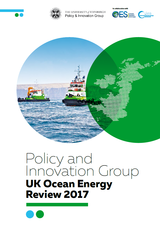 ​The Policy and Innovation Group at the University of Edinburgh has released the UK Ocean Energy Review for 2017. The report gives an overview of the developments in the wave and tidal sector throughout 2017 in terms of the key sector achievements, supporting policies for ocean energy, research and development and technology demonstration.